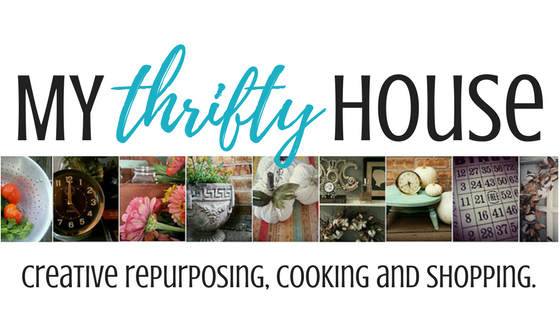 Each month I team up with my blogging friends and share a craft project with you made from supplies I have been hoarding collecting. We call it the Craft Room De-Stash Challenge. This month I am sharing the book page wreath that hangs in my office. 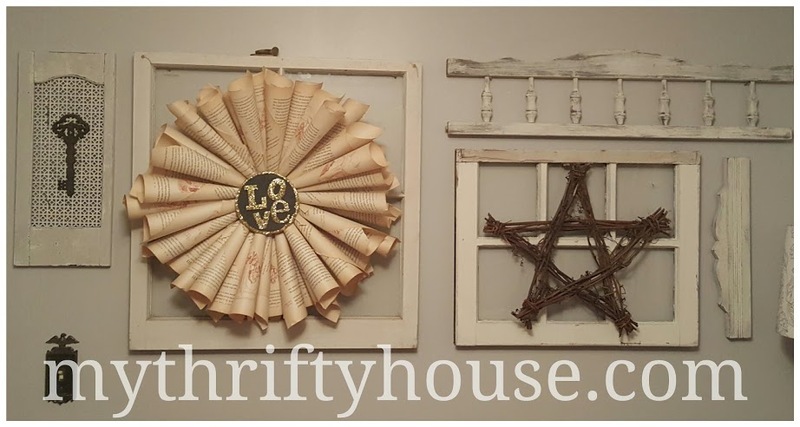 I think this book page wreath just might be one of my all time favorite DIY craft projects. It’s so random and fun hanging on an old window frame in my office and it has a lot of character. It was easy to make and it didn’t take long at all to assemble the 34 cones. As you will learn, I’m an impatient DIYer, I don’t like to follow directions and I don’t like to wait for things to dry. I think I checked all those boxes on this project. 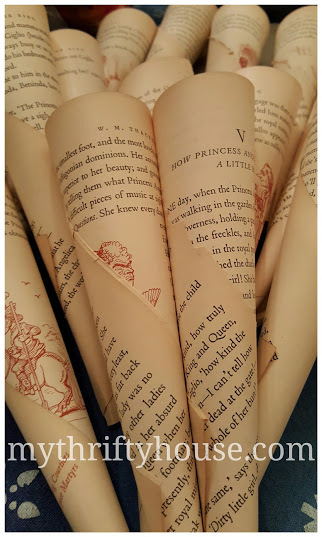 Patience: How hard can it be to roll book pages? When they are old and dry they tend to tear easily so I had to “slow my roll”. Directions: After doing research, I created a Book Page Art Pinterest Board but I don’t think I followed any one set of directions. The typical mash-up project for me is using a little bit of everything and adjust as I go. Once the pages were semi-uniformly rolled, I hot glued them around a 6 inch paper plate and layered them to fill in any gaps. It’s important to roll your pages in a semi-uniform dimension so that you don’t have gaps and get semi-even layers. For the center, I opted to make a Valentine’s Day sign with a piece of scrap cardboard covered with black paper and rimmed with chunky gold glitter. 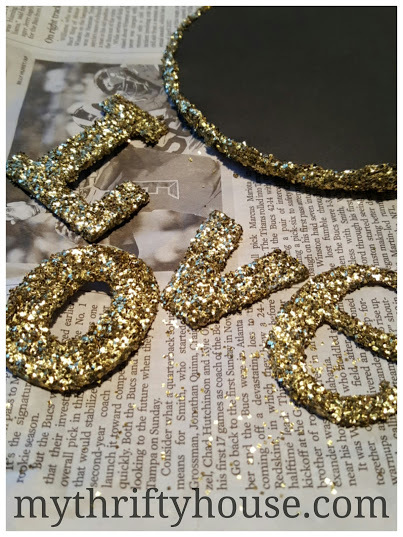 The letters were from my craft supply stash and since none of them matched I “glitterfied” them as well. I attached the sign with a piece of wire that was run through the center of the book page wreath and through the paper plate. The wire also doubles and my wreath hanger. I opted for a removable sign so I can change it out with the season or holiday. 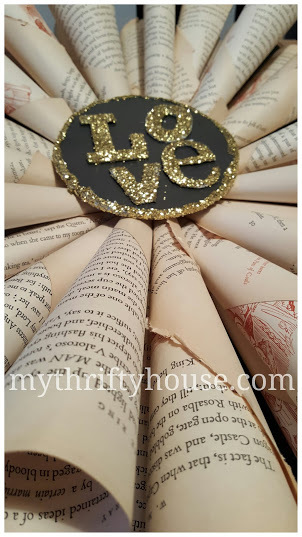 This entry was posted in DIY Projects, Valentine's Day and tagged books, crafts, repurpose, vintage, wreath. Thanks Sam! Can’t wait to see your wreath. Great project! Love the “Directions for Dummies”! That’s totally how I craft, too! That’s how I roll Allison….by the seat of my pants. LOL…thanks for visiting.